The photos in this post have been taken from the Ville de Sassenage Facebook page, and are official postcards. My mother has many, many beautiful photos of the village, our house and the mountains surrounding it but they are all in print and I didn't want to ask her to scan pictures for me while she is busy travelling the world shooting bands and working! I've posted some links below for more information on the area. Some days when the sky is blue I find myself wandering back to summers of many, many years ago, where mornings were very young and evenings crept a long way past a normal bedtime. Nightfall came with the songs of the cicadas, hiding in the long grass by the stream, talking to each other over the sound of the frogs and the water rats scurrying around. The occasional car would race down the back road that passed in front of our house, but other than the rare, muffled sounds from the not-very-close neighbours, the bats, the cicadas and Led Zeppelin or Lou Reed were the soundtrack to those summer nights. A large village on the outskirts of Grenoble, surrounded by mountains that literally loomed everywhere you looked, Sassenage was one of those places that remained somewhat suspended in time while trying half-heartedly to keep up here and there. While you could find small supermarchés and even a Mexican restaurant down at the foot of the village, the centre was up the hill along a windy cobbled road, lined with buildings that were being renovated to create an image of what they looked like in their heyday, before the pollution of Grenoble started its graying damage. Boulangeries and épicéries and boucheries and Tabac/Presse, your odd little old bar and PMU where the older men would grab their Pastis and gossip before dinner, maybe partake in some afternoon pétanque beforehand. The Post Office was at the top of the hill, in an old building, and I spent a lot of time there, posting letters and packages and walking back down the hill in the afternoon heat, shops closed for the siesta until 3 or 4pm, shutters firmly closed over windows to keep the sun out and the cool air in. Summer afternoon calm, no rush to get anything done, just the tranquil sounds of the water moving through the fountain in the square, the birds hiding out in the shadows of tree leaves and the occasional car driving past. Around 3 or 4pm the old village would start to wake up again, the sun lower in the sky and naps having revigorated everyone after their solid lunches. The boulangerie and the fromagerie would open their doors for 3 or 4 more hours and the square would get a little busier again. The little parks would fill with parents and children and we would sometimes join them, my sister, brother and I, and play there until dinner time. Unless that day had been pool day, when we would rush to the pool in the morning with sandwiches and crisps and drinks and stay there all day, basking in the sun and jumping in the cold water, refreshing even under the hot sunlight. The village was a strange one, unlike the villages where I had lived as a young child in England, with its “old” part and its “new” part, no real border between the two, probably just a little village that had slowly grown towards the next little village towards the city of Grenoble. The A tram would leave you in Fontaine, and we would either walk the 15/20 minute journey home or we would jump on the 51 bus for a couple of stops along the main road. And then off, past the high school and the side road by the stream towards our house, a sizeable standalone villa in cream and brown with the peach tree that we planted from seed in front of it and the lawn neatly trimmed and the flowers and bushes and grapevines popping up all around you. It was a beautiful house, with real marble floors that were heated by the hot water pipes underneath them in the winter and the sun would shine brightly through the windows and doors. The balcony was huge and looked out onto the road and the walnut tree across from us, and the kitchen was always cool in the summer. Our bedrooms were upstairs, in the rafters, with secret cubby holes and sanctuaries, light coming in through the skylights, peaceful until it would rain and then all hell would break loose on the roof, a symphony of raindrops clattering down, drowning out all other sound. The summer storms in the Isère were always quite spectacular, the city and surrounding areas protected by the mass of the Vercors, Chartreuse and Belledonne mountain ranges, but these walls of stone never stopped the sudden lashings of torrential rain, booms of thunder pounding over your head and rays of lightning landing wherever they felt destined to land. And an hour later the sky would be a pure blue for a little while, until the pollution crept back in again to change it to grey-blue. There are memories of hiking in the Vercors, around the areas where Jean Prévost and his contemporaries fought the Nazis and were betrayed; along the little streams and rivers that fell down the mountain sides, sometimes grouping up into waterfalls and natural pools under the trees, a slight danger if you got too close, the rushing and the clashing of the water over the century smoothed stone and down into the pool below. Fresher and cleaner than the swimming pool, with big rocks to use for sunbathing and picnicking and caves up ahead for those who would rather explore the inside of the rock than the outside. I’m not one for rose-tinting my childhood, but there was something special about those years lived in Sassenage, the summers spent free and sometimes carefree, outside in the sun and the rain, running errands through the village, learning French as the days and the years passed. Writing letters to friends far away and waiting impatiently for the postman to stop by on his bike every morning, hoping that he would leave something in the letterbox for me. I used to write and receive so many letters, and I have kept every single letter received, but that is a story for another time. 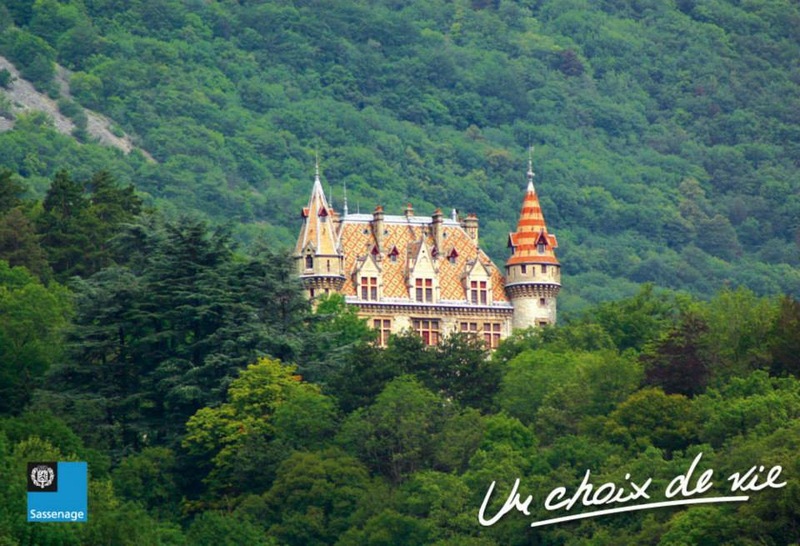 We could see this beautiful chateau from our house - many a day I would daydream about living there.